Barnes & Noble College summer interns pose with Manager Tamara Vostok. 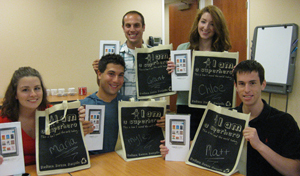 From left to right: Grant Marcus, Chloe Leach, Matt Goldberg, Vostok, Maria Cafferata and Myles Marcus. Missing from the photograph is Stephen Brooks. While some college students spend their summers serving as camp counselors, waiting tables, or scooping ice cream, some elect to jump into the business world with a summer corporate internship. This summer, Barnes & Noble College employed a group of summer interns to work in consumer and corporate marketing. As a company that operates nearly 700 college campus stores nationwide, hiring college interns from the very campuses they serve is a perfect fit. Paid interns have a distinct advantage in the job market, according to results of the National Association of Colleges and Employers (NACE) 2012 Student Survey. The survey found that approximately 60 percent of 2012 college graduates who took part in paid internships received at least one job offer upon graduation. The study also found that paid interns spend more time than unpaid interns engaged in “real work,” and thus have the opportunity to gain more of the relevant work experience that employers value. Penn State sophomore Chloe Leach interned in Consumer Marketing writing articles for the student-focused blog The College Juice, posting and monitoring status updates on multiple school Facebook pages and working on other social media projects. Capturing the attention of college students requires a multi-faceted marketing campaign and a multi-targeted approach. The socially savvy interns posted on over 375 campus bookstore fan pages and university fan pages, blogged an array of articles on topics ranging from how students can save money to learning good study habits, and answered hundreds of textbook questions from students who posted on their school’s bookstore Facebook pages. A total of six college students interned at Barnes & Noble College’s home office in Basking Ridge, New Jersey, this summer. Other interns included sophomore Myles Marcus from Berklee College of Music, Hofstra University senior Matt Goldberg, junior Stephen Brooks from Syracuse University, and junior Maria Cafferata from Moravian College.